During his vetting, CS for ICT Joe Mucheru outlined plans to revive state broadcaster KBC. Joe suggested the sale of prime land held by the broadcaster to facilitate its modernization and pay debts owed. He further suggested some of the equipment held at its facilities relocates to Konza City and the land put to good use with the private sector. The CS also visited the offices of the state broadcaster in a familiarization tour. In an update, the chairman of the KBC board said the broadcaster was to embark on a re-branding exercise at a cost of Kshs. 9 Billion. The re-branding exercise was part of a five year strategic plans aimed at reviving and enhance its competitiveness which has hit lower lows in recent times. The state broadcaster outlined among other things plans to sell its content to other players besides using digital platforms to grow its revenues. According to Capital FM, the state broadcaster has today had its offices clamped down by City Hall owing to non-payment of land rates amounting to Kshs. 2 Billion. The state house officers blocked the main entrance to the offices by dumping garbage to prevent entrace. The officials also took over management of parking at the broadcaster’s office. KBC problems stem from Kshs. 8.2 Billion loan taken in 1989 to fund the acquisition of medium-wave equipment. 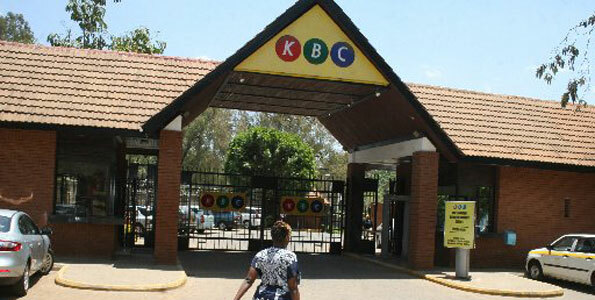 KBC expected to pay back the loan from sale of television permits, which were set at Kshs 1,000 per set. According to Business Daily, these permit fees were abolished in 1997 thus denying KBC over half a billion in income.